We have over 700 pictures of our trip we need to get through and organize. Don’t worry…I don’t intend on turning this into a “my vacation” blog. I did want to share a few pictures with you today so you know we REALLY were in Venice and Greece. After we have more pictures ready to share I will add a page to my sidebar so you can take a look if you like. Venice was as beautiful as it was twenty years ago when we were married there. The only thing that seemed to have changed is now there are a lot more people and boats! Mykonos was our favorite stop on this trip. Steve and I were one of the few off the boat as soon as it docked at 7:00 am. We wandered through the quite alleys where there were no other tourist and the locals were just sweeping off the streets in front of their homes. It was so peaceful and beautiful it almost seemed unreal. The town is famous for it’s beautiful jewelry and I took some time to do some shopping. I came home with an pretty blue enamel bracelet and earrings that remind me of the color of Mykonos. 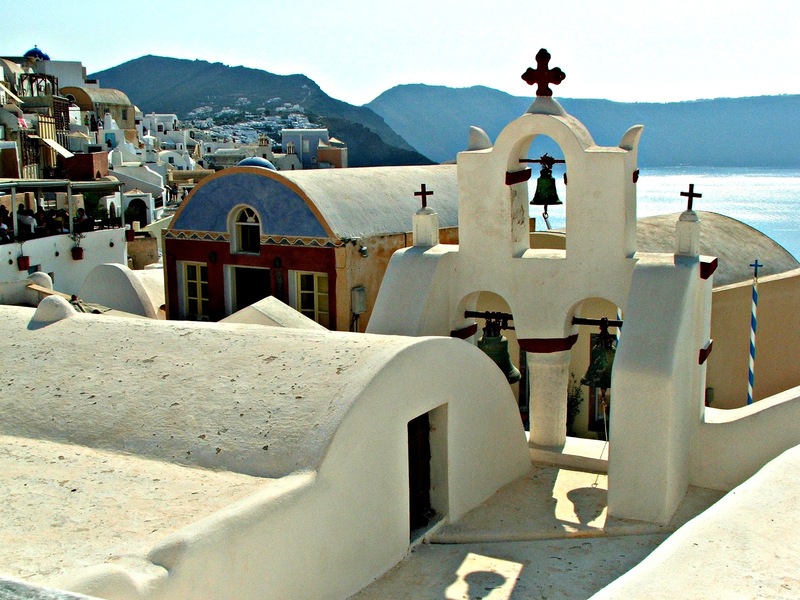 We loved Santorini for the beautiful views and architecture. I braved the cable car to the top which was shaking and moaning the whole way. Here I bought some handmade Olive Oil soap for myself, a couple of trinkets for the giveaway and I discovered Cappuccino Freddo which is an iced coffee with a cold milk froth on top…delicious! I hope you like the things I selected for you on our trip. 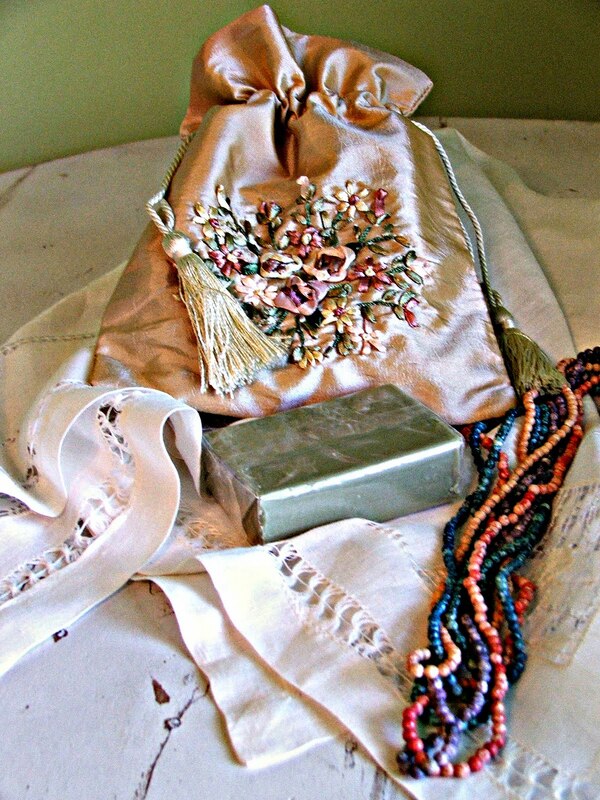 The giveaway includes a pretty pouch with silk flowers and a vintage square 32″ linen table scarf both from Venice. Also included is a bar of pure olive oil soap and a six strand necklace of natural coral, amethyst and turquoise from Santorini. To enter the giveaway just leave a comment telling me your favorite vacation spot. For an additional entry help me spread the word by adding the giveaway to your sidebar or FB page. Be sure and leave a second comment. The giveaway will end at midnight on 9/22/11 and I will contact the winner the next day. If you don’t have a blog please make sure and leave your email address so I can contact you should you win. Good luck to everyone and don’t forget to link up here Wednesday evening for the Open House Party. I’ll be sharing our trip at the parties below. Oh Sheri, beautiful pictures and would have never seen these places if you had not shared them. Thank you, I enjoyed them very much. Your giveaway is absolutely beautiful. The pouch is georgous. Thanks for hosting this giveaway. I think of all my trips, which certainly does not compare to your trip, would have to be St. Croix. We use to go every winter to get away from the cold winter for a few days. I love it there. Isn't Venice amazing?!? I was there about a year ago and, I swear, spent the entire time walking around in awe. I enjoyed looking at your beautiful pics…what a great place to visit. Some of my daughters friends were there during the summer and came back with some great pics too. Sad for her she didn't get to go…her sister had all our money with her wedding:( My favorite trip that I have made in the last 26 years (that's how long I have been married) was to CA..spent 10 days seeing all over that wonderful state. I haven't been there, but I think Italy or Provence would be wonderful…Thanks for the give-away op! Whoa! SUCH gorgeous pictures! Thank you so much for sharing them. My husband and I have talked about a Greek Island/Italian cruise. Is that what you went on? 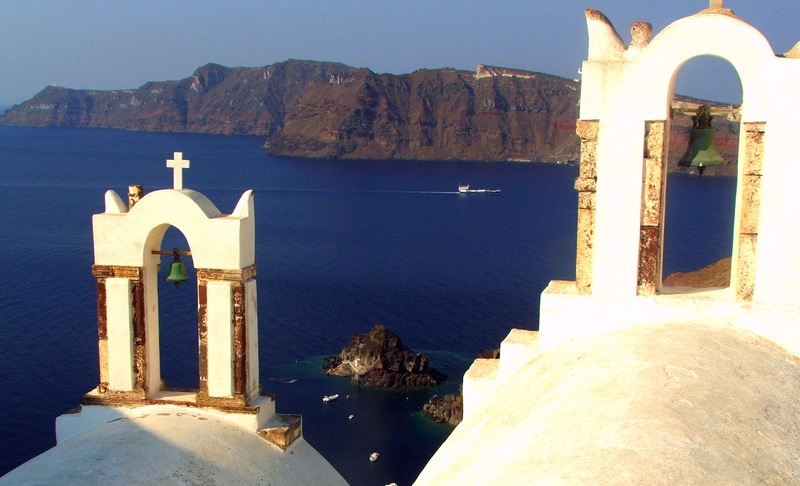 I have a lot of favorites, but the Greek Isles are the best! You pictures are terrific! gorgeous photos! My favorite vacation spot would have to be Vancouver, Canada. It was gorgeous! Beautiful pictures. My fave vacation spot is in a sand chair on the edge of the tide line – any beach will do! I am jealous of your trip; I would love to go to Venice sometime and the Greek Isles always look amazing. My favorite vacation spot ( from our Med cruise in 2009) was Barcelona. I hadn't expected to be impressed by it, but I fell in love. Hope to get back sometime and spend a few days there. If you want to relive your trip to Mykonos and Santorini, I suggest you rent the movie "Summer Lovers." It came out in 1982, with Daryl Hannah and Peter Gallagher. The plot is thin, but you get to relive the beaches, mopeds and parties in technicolor. I am a new to follower of your blog. Thanks for sharing your amazing pics. Welcome back Sherry! Your pictures are absolutely beautiful! I would love to go there some day. What beautiful pictures, and a thoughtful giveaway! We travel very, very little–and I don't imagine that will change until we have fewer children at home! But the last non-family trip we took was to Island Park/Yellowstone, and I *loved* it. I want to go back in the worst way! Beautiful pictures! I want to go to Greece soooo bad! I think one of my favorites is Bermuda. Sherry what an amazing trip. I have been to Italy, not Venice though. Loved Santorini!! My favorite vacation spot is anywhere where there is sand and ocean waves! Your giveaway is wonderful. I hope I win! Welcome home and it looks like a gorgeous trip. 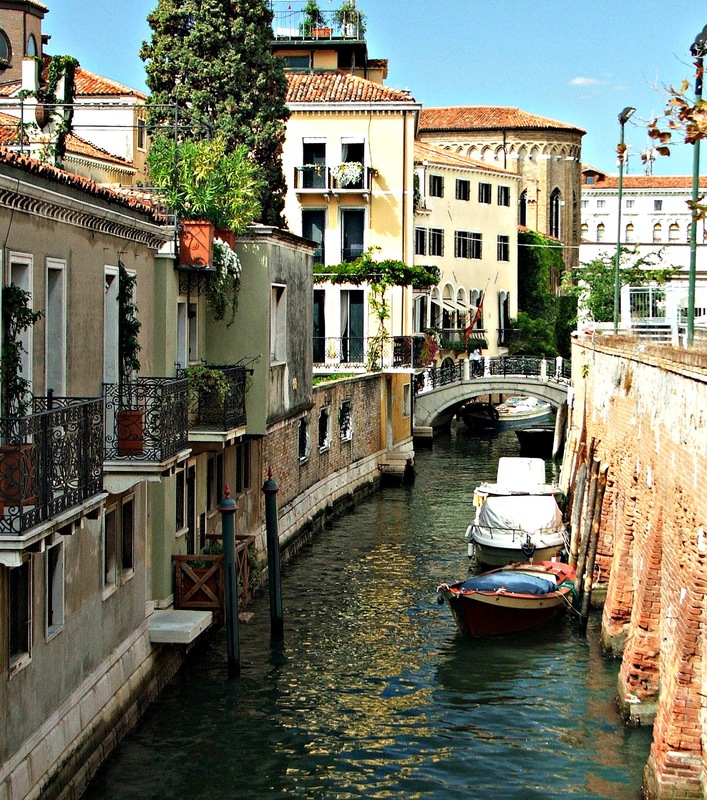 I don't think I will see them myself…but I would love Venice! Beautiful giveaway! Oh wow, what beautiful photos of what I'm sure are some of the most gorgeous places on Earth! Of all the places I have traveled to, tropical & not, I still love NYC best. I loved Venice when I was there 3 years ago. I loved all of Italy actually. I hope to go back someday. 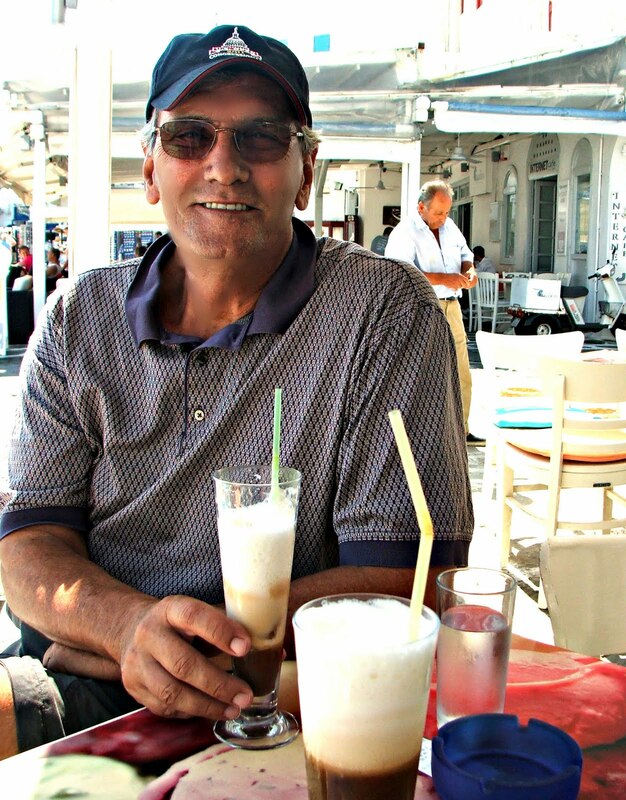 I have also been interested in the Greek Islands, so it was lovely to see your pictures! My favorite vacation spot is Washington DC. I was fortunate to visit twice in one year, once in the summer and then nearer to Christmas. I couldn't get enough of the Smithsonian. One of my favorite things that we did was to visit Falls Church, VA and walk around the chapel that was attended by some of our founding fathers. Looking at the grave markers in the cemetery was a spiritual experience I'll never forget. I'd love the win the give away. You've chose such lovely things, and I enjoyed your beautiful photography. Thank you for sharing. Great giveaway! Thank you for your generousity. My favorite vacation had to be Southern France where we rented a beautiful home and had 3 glorious weeks to relax and enjoy the countryside. Welcome home friend!! What an absolutely incredible trip and you looked so gorgeous in that photo…your hubby is pretty handsome too! 🙂 How sweet to do a giveaway with some of the treasures you brought home. Ok…my favorite vacation spot is a toss up between Maui and the Napa Valley! I have never been to Greece and I want to go, but Paris is always my favorite. I am also liking you on facebook!!! Really want to win 🙂 YOU ARE SO SWEET TO BRING US BACK SOUVENIRS!! I mean I am adding the link to fb. Welcome home! I think you didn't miss any wild weather or tectonic plates shifting while you were away. 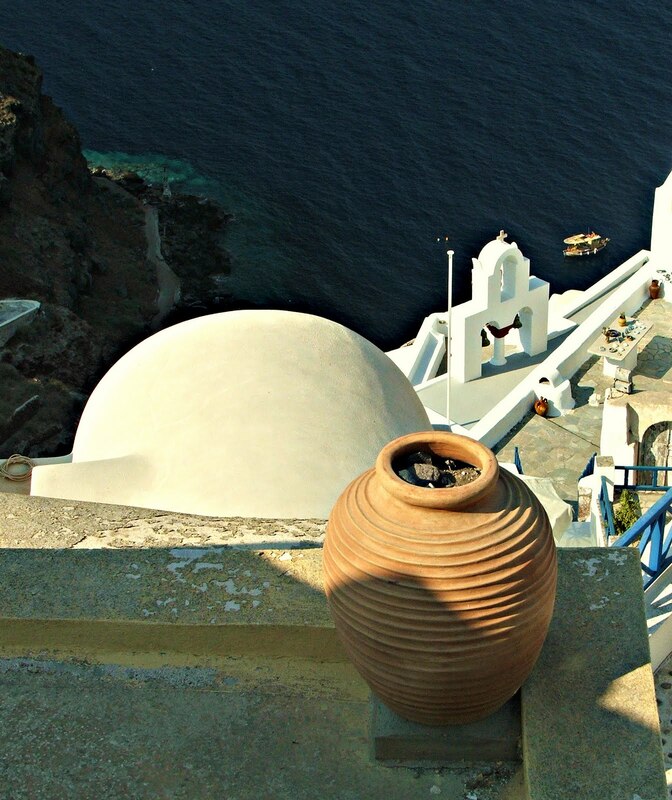 Your photos are just lovely and you seem to have captured the amazing blue of the Greek sky! My favorite vacation spot is southwestern Colorado. What lovely give-away goodies. You are too kind! Those are beautiful pictures, Sherry. My guy and I are planning a trip to Italy next year and hadn't thought of going to Greece but I do believe your pictures have changed my mind! I remember that gorgeous scenery from The Sisterhood of the Traveling Pants. My favorite vacation spot is Destin, Florida where the gulf water is this wonderful blue green color and the sand is the whitest I've ever seen. Please enter me in your giveaway. Love that sweet flowered pouch…. Thanks for sharing the great pictures. I have traveled most of the 50 states and just returned from a two week trip to Alaska. It was beautiful so I'll say it was one of my favorites. Beautiful pictures! My dad took me to Europe for 2 weeks when I was in 10th grade, and I would have to say that has been my favorite vacation ever. We started out in Germany and went all the way down to Italy. We didn't make into Venice, but I sure would have loved that! Welcome home, Sherry! Your photos of Venice are fantastic. I have not been there since college! My favorite vacation spot is Beaver Creek, Colorado. Thanks for hosting such a special giveaway. There is nothing more beautiful in the world than Venetian table linens! The pouch is gorgeous!! Please enter me in your awesome give away! Sherry ~ Your pictures are so beautiful. Thanks for sharing you lovely vacation (the lovely parts not the spoiled food parts). My favorite vacation spot is Dauphin Island, Alabama. Such GORGEOUS photos! Wow!! 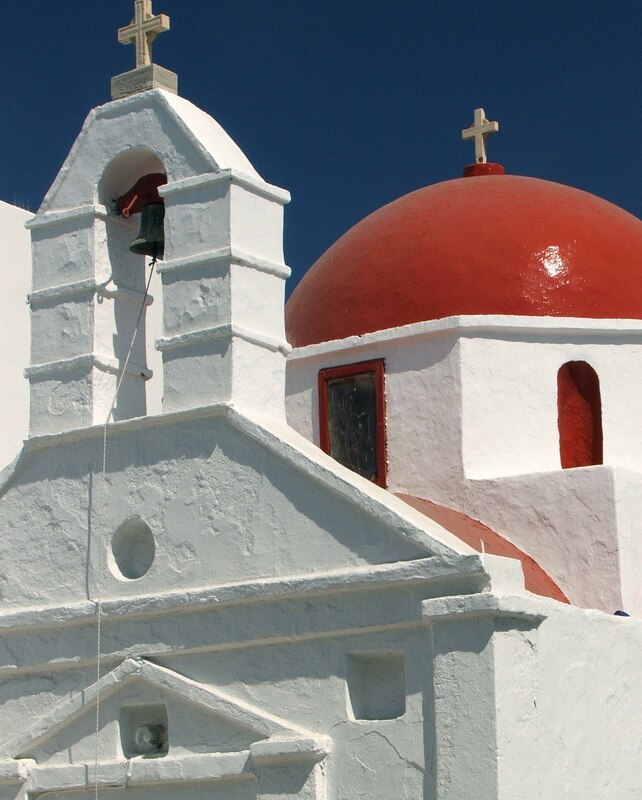 I just love those photos of churches in Greece. It's funny–I think my favorite vacation spot is Kiawah Island. But my favorite trips have been to Europe–one to London, one to Paris, and one to Switzerland. I'd love the fact that you were able to take this trip with very little $$ spent. I'm so proud for you! Those are just amazing photos! Thank you for having this giveaway. It would be awesome to win pieces of your vacation. I've been to Maui a few years ago and it was awesome. Welcome home, Sherry! This is an amazing giveaway. Thanks so much for the opportunity. I am dying to get to Italy and Greece! I taught Latin to elementary students so I love anything classical. Got to go! Oh how beautiful Sherry! Looks like you had a wonderful time! My favorite spot is Martha's Vineyard! Sherry, your pictures are just gorgeous! I wish I could ask you about every shot. You two are so fortunate to be able to go back to where you were married, in such a beautiful place! Ok, and this is my comment for your very generous giveaway. Such lovely things. And, I have your giveaway on my side bar. What a fabulous place to vacation – hubby knows it's my dream vacation destination. Your pix made me want to go even more now, but I'll be patient and wait until the time it right. Thanks for the opportunity to enter your giveaway. To date, my favorite vacation was the time we made a spontaneous weekend trip to the Grand Canyon – we had a blast! Looking forward to seeing more of your vacation photos. Your photos are wonderful…more please…I have never been to Venice but I am hoping to hop on over there from Paris one day…so much better seeing your photos and reading your take on it than looking at travel sites so from my perspective you can't post too many. Beautiful photos Sherry. Congratulations on your anniversary, and what a way to celebrate going back to the beautiful city where it began. 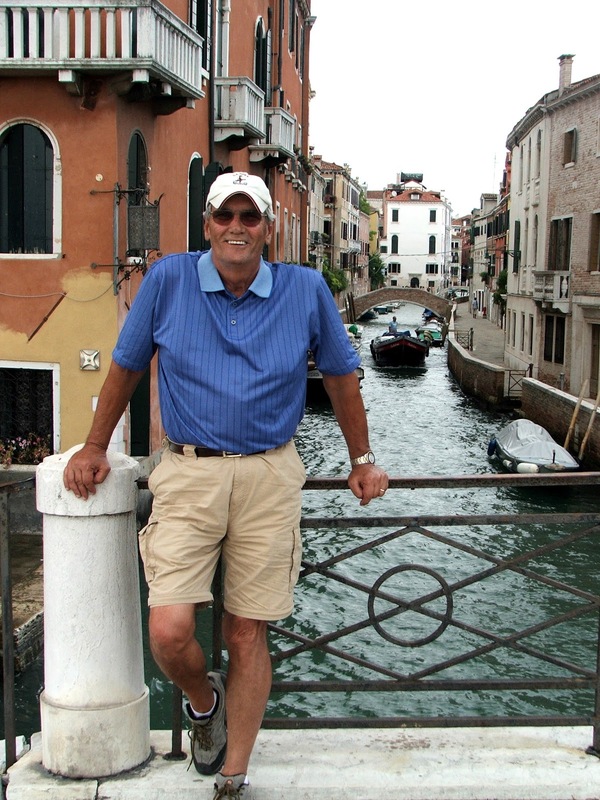 Jim and I have been to Venice and loved it, but my favorite spot has to be Paris. I love it for so many reasons. Jim's favorite is no doubt Roma, he loves history so this is heaven for him. Sherry, your No Minimalist Here button is on my sidebar with a link back to your giveaway. Thanks for the chance to win. I have never traveled abroad, but I did go to Long Beach Island, New Jersey this summer and loved it! Next to going somplace for vacation…I can have a vacation every day sitting in my back yard or front yard watching my birds, listening to them sing, and taking pictures of their beauty! I'm one of your biggest fans! I love your pics! Oh my word! How lucky you were to go there. I've never been. It's hard to not take a bazillion pictures when you're on a trip of a lifetime! Thanks for sharing. Your pics look amazing. I want to go! You look fabulous on Mykonos! Sherry, I posted your giveaway on my sidebar! My favorite vacation spot is Anna Maria Island, Florida — I loved it so much, I moved here 5 years ago and never looked back! Oh my, your pictures are magical. I do not think it's possible to take a bad picture in Greece, it's so beautiful and MY favorite vacation spot. I've just posted the link to your post on my FaceBook wall. Oh Sherry, what beautiful pictures! greece and italy are on my list of places i want to go. Scotland was so far my favorite as I felt I was HOME due to my ancestry. Thanks for the giveaway. Sherry, these photos are wonderful. They look so professional. Not sure I have a favorite vacation spot, but my favorite cruise is the Alaskan cruise and I hope to do it again some day. I think you can turn your blog into whatever you want and I think many, many people would love to see your photos. I love Venice and have been there many times, I am sure that you had a wonderful time. As for favorite vacation spot, too hard to narrow it down, but I will say PAirs, anywhere in Scotland and Italy! Sorry to hear about your power outage from the hurricane. In my neck of Virginia we only lost power for two days but even that was too long. Thank you for coming to visit my blog. I would be happy to tell you where I found my finds in Virginia. I will find the addresses and email them to you. Welcome back Sherry! We've missed you! So glad you had a wonderful trip. How fun to go back to where you were married. How romantic! My favorite vacation spot, oh that is hard to choose, but I must say I pine for the Rocky Mountains! What a wonderful trip you had! Many years ago I spent a few days in Venice. Since then I have vacationed in Ireland (twice) and in Hawaii. I would be hard pressed to choose a favorite! I just recently found your blog. I have a little one started…nothing fancy, but I love getting inspired by reading others. What a wonderful gift to be able to travel to Venice and Greece! I would love to go there one day. I haven't been on many vacations in my travels (but my parents were missionaries in Belgium when I was young so living in Europe for a few years was wonderful and I had the chance to travel to Australia and Mexico) but the place I would love to go next is Ireland. Betty @ My Cozy Corner~I love your blog. It's me again. Betty from My Cozy Corner. I put your button on my sidebar with info about your giveaway. What absolutely gorgeous pictures. They make me want to escape on a little vacation myself. We always enjoy going to the Keys. Wonderful pictures… I loved that picture of yours with white buildings in the background. 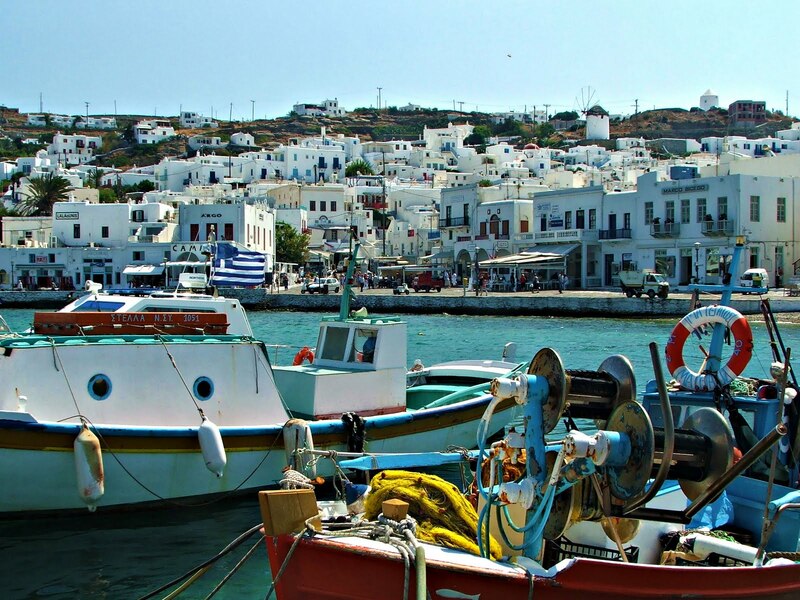 You looks so graceful and so does the city of Mykonos. I wish I get a chance to visit the place some day!! Beautiful pictures!! I would love to win your giveaway. My email address is jacki_ste@msn.com. Love your blog. Your trip sound fabulous! Beautiful scenery. I would love to take the same trip. Look forward to more pictures. My favorite vacation spot is between Paris and Provence. Both were wonderful. Your giveaway is great. I will post your giveaway on my sidebar. Glad you are safely home. Sorry about your food in the freezer. Please enter me for your giveaway. Those pictures are so beautiful! I hope to someday visit. Thank you for sharing, glad you had a wonderful trip. Thank you so much for the beautiful pictures for I am sure I will never get to travel to such a beautiful place. I get so excited when I get to travel to Portland Oregon and Savannah Georgia. I love both cities and getting ready to go to Georgia next month. Venice is amazing right? My favorite place is Venice, absolutely loved every minute of my two days stay there 6 years ago. Thanks for sharing the pics and the wonderful giveaway. What beautiful pictures of your trip. I so want to get to any part Italy or France someday. I would have to say that my favorite trip was to Aruba. I just love the clean blue water of the islands. I have seen some of Italy, but it was almost twenty years ago. Right now, if I could go spend a week anywhere, it would be Vermont. The photos are breathtaking, Sheri…thank you for sharing them, and for hosting a generous giveaway. What gorgeous pictures!!!!! Our favorite spot to vacation is Napa Valley. We are saving for a family trip to Ireland in a few years! I love your beautiful giveaway sweet lady.Im going to post your Button on my blog.I also follower you !! All your photos are georgous. I also love the Country French look. I hope you have a great week. What gorgeous pictures and how lucky you are to have traveled to such beautiful places. I would to travel some day but so far have not been many places. I did like Hilton Head when I was there many years ago. I would to win your contest. What beautiful photos Sherry! Looks like it was a dream vacation! Great giveaway! Id love to bath with that soap the whole idea is romantic.My most favorite place to visit is local I am afraid Hot Springs Arkansas. So much history and romance. Love that handsome husband of yours!! These are wonderful photos of what I'm sure was a perfect trip. My favorite vacation spot? I'm not picky … I love anywhere with sand and salt water. This fall, we are going to spend Thanksgiving with friends and we're going to Key West. I'm really excited. Gorgeous pictures of a dream vacation. My dream vacation would be to Paris, France. But for now it is anywhere my family is and I don't have to cook the entire time! Ohhh my goodness! 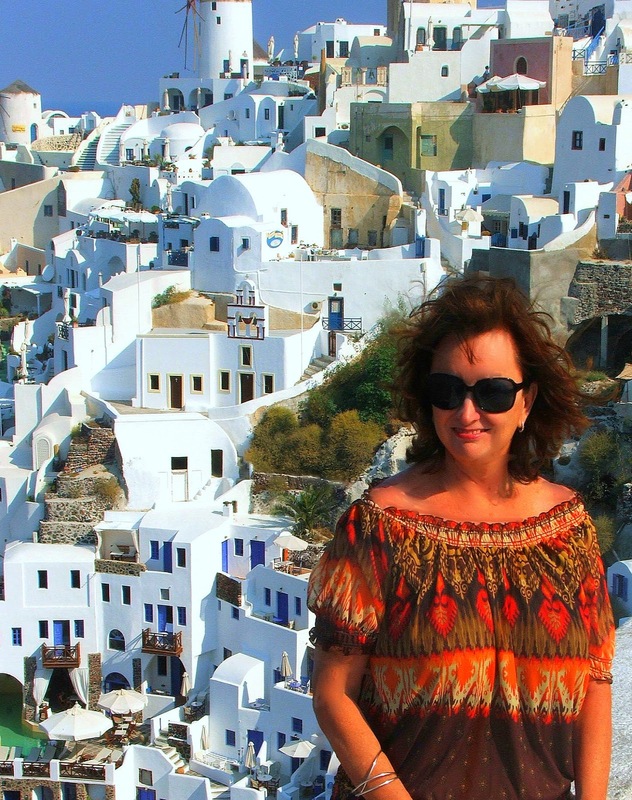 Sherry, your trip to Venice and Greece was FABULOUS!!! 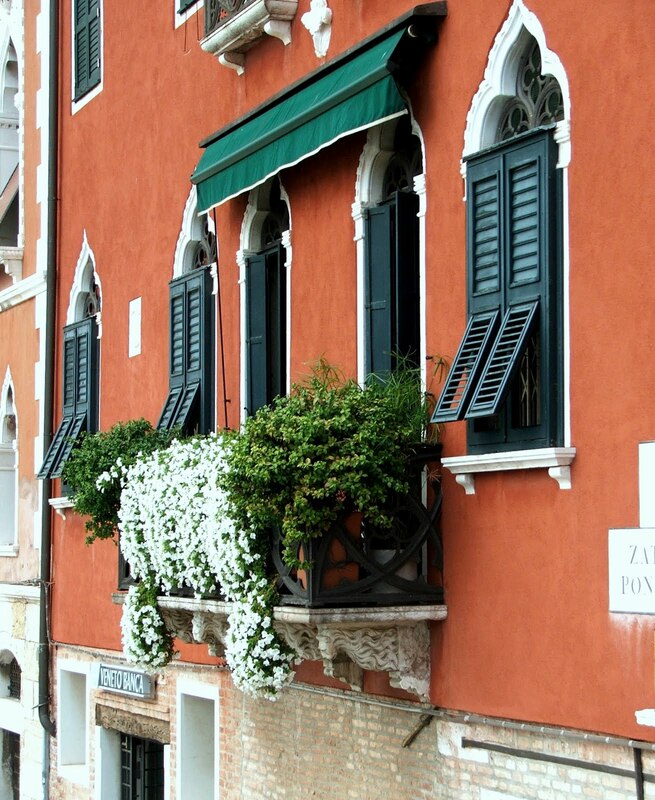 I loved looking through your beautiful photos…the photos of Venice reminding me of our trip there! I have never been to Greece and would LOVE to go! You know, the thing that struck me about Greece was that all the buildings are white! Soooo very beautiful! 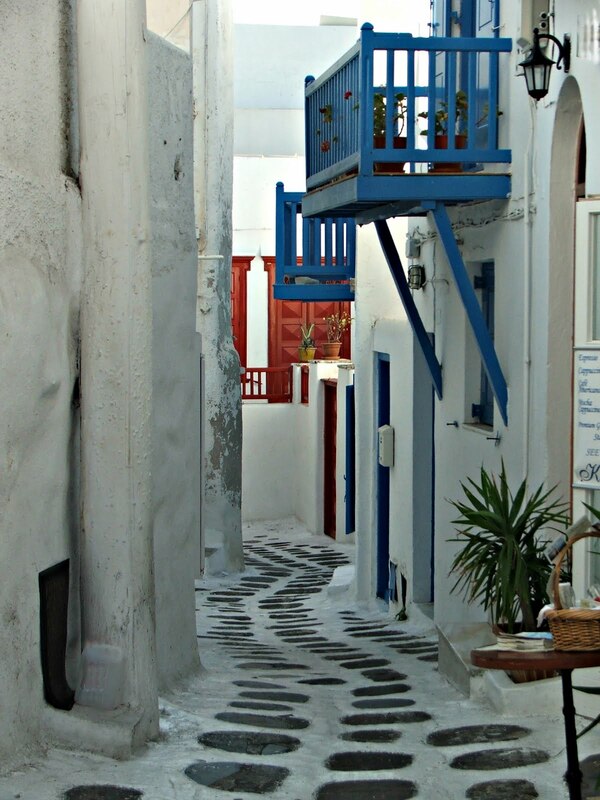 The one photo that you shared in Mykonos…of the alley way leading downward…was just sooo awesome! I've never seen anything like that! Thank you sooo much for sharing a few of your photos with us…I'm looking forward to seeing more, sweet friend! How very sweet and thoughtful of you…to host a gift giveaway for us! Ohhh my…the gifts are lovely and I would love to have them! Ohhh..gifts from Venice and Mykonos…how dreamy! Thank you so much for doing this sweet and generous giveaway for us! You're such a dearheart!!! 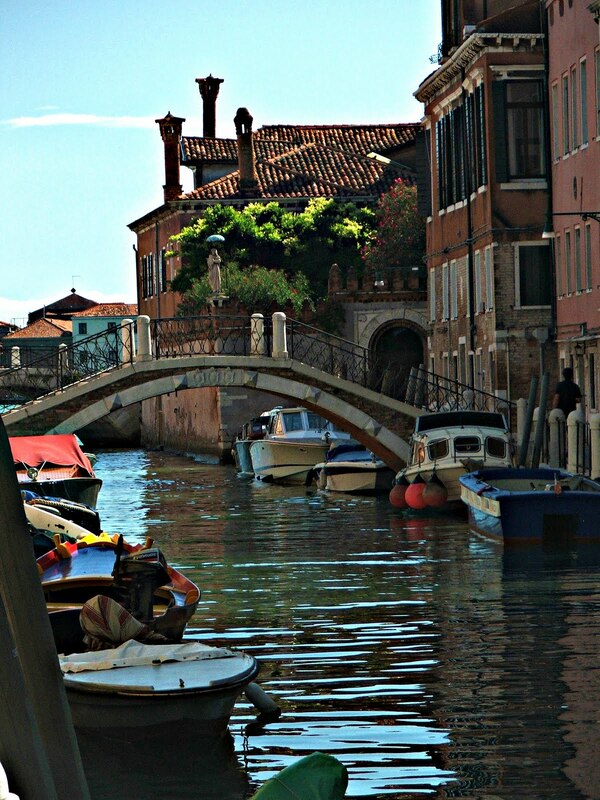 Ooooh those pictures of Venice made me drool it is so beautiful. And Greece sounds mysterious. I love your pretty orange floral top too. My favorite place to go is "I don't know" I have never been out of the country unless of course you call being in Southern Florida out of the country. Oh well, maybe someday! The Olive Oil soap looks inviting along with all the other lovely goodies! How kind of you! What amazing photos and fun stuff you brought back! I found this post through art is beauty and I'll never go back! My favorite vacation spot so far since u haven't traveled much has been Maui where we went on our honeymoon. I'm looking forward to a trip to Tuscany, Greece and Paris in a few years though! Your vacation looks heavenly! My favorite vacation so far has been a toss-up between the Western Caribbean and Hawaii. Warm water scuba diving beats cold water every time! I envy you your vacation to Greece and Italy – I have been wanting to go there since I was a little girl! I keep telling myself some day, some day! Thanks for the giveaway; that's very generous of you. hi Sherry, I'm visiting you tonight from WOW. I look forward to your pics on your sidebar. Thanks for sharing some of them on this post. Venice was a great city, we were there during Carnival and we enjoyed getting into the spirit of the festival with masks of our own. We sure didn't look like tourist that trip! Such fun and wonderful memories. Hi! LOVE your pictures and am totally JEALOUS now, thanks, lol. I have never been outside the good ole USA, but my fav vaca spot here is Santa Barbara, CA! I think its about as close as you can get to a European vacation without leaving the states…Thanks for sharing! I LOVE Venice and your pictures are just stunning! I'm new to blogging, so the idea to bring back a gift for a giveaway is so cool. The pictures are gorgeous! What colors! I'm following you now, and will add your giveaway to my blog! Our favorite vacation spot is Paris. Would love to go back soon–very soon! Tough call…anyplace with a beach is my favorite vacation spot, but I'll say the west side of Maui, Hawaii and the Outer Banks, North Carolina top my list. 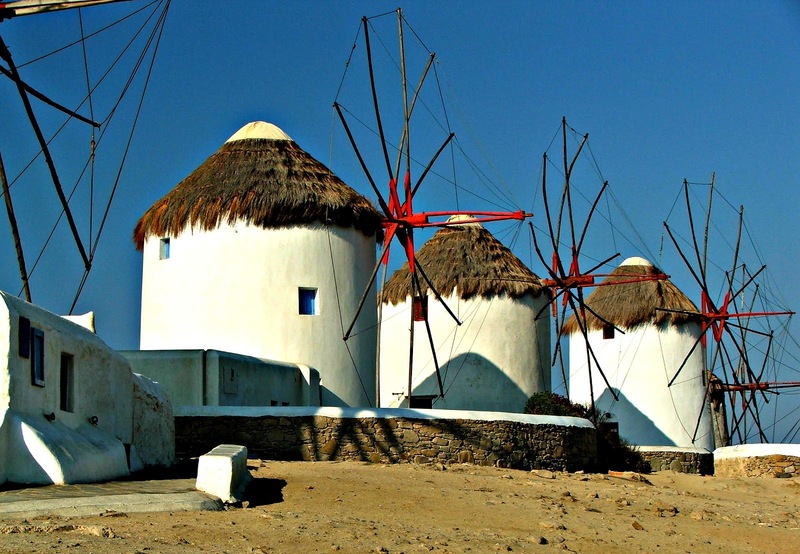 The photos from Greece take my break away…the vivid blue sky juxtaposed with the white architecture…amazing mix of man-made with nature! Oh, I just found your vacation pictures. I haven't been to Italy, but my husband and I were treated to a cruise on the Windstar, out of Istanbul,Turkey and then to the Greek isles. It has been 4 years and we both can't get over the beauty and serenity of Mykonos, Santorini, and Rhodes. I love decorating, art, architecture, and people watching……so needless to say Greece was Wonderful! Your photos are amazing! Barcelona & Madrid Spain was my favorite vacation. I would love to go to Paris… it's on my bucket list. I haven't been on a vacation in over 25 yrs, and I doubt I ever will, but I would love to go to Ireland! Thank you for the chance to win this lovely giveaway. I am a follower! Your wonderful photos bring back memories of our Mediterranean vacation..13 years ago…I love how much it looks the same. My favorite vacation spot , though, is still Carlsbad, CA. What lovely pictures. Thank you for sharing them. You certainly found some lovely things; that olive soap must smell wonderful. Edinburgh in Scotland is my favourite place to go. I took Hubby there the last time we were in the United Kingdom and he loved it. Your pictures are wonderful and we are planning a trip to Greece soon, so I was loving those. We went to Italy and Turkey last year at this time and I must say Istanbul was a destination I would go to again. What a treat to see those gorgeous views today..it's cold and rainy here and I can just feel that warm Greek sunshine through your pictures! My favorite vacation spot recently was Seattle WA..never been there until this summer and loved it! Not as exotic as your trip, but hey! If you like to read, you should check Donna Leon's mysteries, set in Venice, and Maeve Binchy (Nights of Rain and Stars, I think) that one's set in Greece…both great reads! Thanks for the great giveaway! Hope to win! WOW ~ Stunning!!! Both the locations and YOU! On our "To Go" list. Hi, Sherry. What a wonderful trip to celebrate your anniversary. Looks like a fabulous time. My favorite vacation spot is Paris. 😉 Hope to be there soon! You could share all 700 with me and I'd be here daily to delight my eyes and take a virtual Trip with you! *winks* Beautiful photographs of a Dream Trip… lucky Gal! Poland… Boleslawiec, Poland. The most charming place I have visited although I am considering your trip as my next. 🙂 Much love to you this week. Wonderful pictures in Greece !!! Are our islands beautiful and singular ? ?